In this third installment in our raising green kids series, we’ll take a look at the ever complicated toddler. Toddlers to preschool-aged kids can be challenging. They’re just learning that they CAN do stuff on their own, and then boy, will they let you have it when you try to help. Toddlers are getting crafty, forming opinions and sadly, those opinions usually differ from yours. Luckily, this age group can also be a lot of fun. Toddlers, hands down, say the most adorable things and can be really funny, plus this age group is ripe for learning eco-skills. 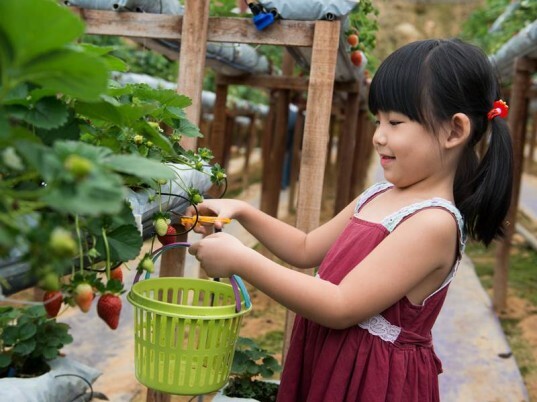 Get your toddler to preschool aged child on board with green living, by incorporating personal responsibility and a lot of fun into eco-lessons. Give your tot eco-responsibilities: Toddlers can start learning green living skills early on. Have your tot help you sort recycling, have him help you plant a tree or let him pick out the colors of the cloth (not paper) napkins you use during meals. Toddlers easily understand turning off lights, turning off water while brushing their teeth, and why used items are sometimes more fun than new. You can also get your toddler his very own reusable water bottle. Be sure to explain why these practices are healthy for the planet. Limit technology: Toddlers can make you nuts, and sometimes you need a break. However, lots of parents start using technology as a babysitter during the toddler years for some respite, and though it works, all it does is set your child up for a life where they have no clue how to entertain themselves without tech. When you do allow your child to watch movies or play video games, stick to family-friendly non-violent fare. Focus on healthy eating: Serve healthy organic food and start conversations about your choice with your toddler. Toddlers won’t understand pesticides, calories and the concept of vitamins, but they will understand terms like “Good portion sizes,” “Organic is healthy for us,” and “Treats are fine, just not all the time.” It’s important to start healthy food conversations early on. Additionally, picky eating tends to rear its ugly head in the toddler years. Poor table and eating habits only get worse if you ignore them, so try this picky eater toolkit if you want your child to be on board with your healthy family meals. Get outside and focus on nature activities: Keep growing your child’s love of nature with activities like camping, hiking, planting a few seeds, berry or apple picking, nature crafts, Farmers’ Markets and lots and lots of general nature walks. Discuss the animals, plants and other objects you see. Build community pride: Toddlers can do park clean-ups and even beach clean-ups under a watchful parent eye (look out for sharp objects). Toddlers can also get involved at their local animal sanctuary (as a visitor), a community garden, at a local library story-time (picking up books), or visit an elderly home and hand out treats. Building community pride and thoughtfulness takes time, so start early – you can learn how to volunteer with your child here. Subscribe to Inhabitots’ newsletter so you don’t miss even one post in our raising a green kid series, which will help you grow a super green kiddo from birth all the way through college.